Riding improves your mood, health and helps you save some bucks. So if you must be on the road on your bike, it is vital to make your own finding on the bike that is suitable for you. 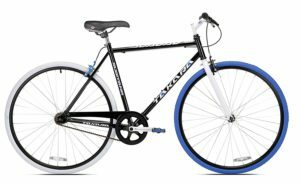 We will briefly look at the Takara Sugiyama Flat Bar Fixie Bike review as it is a top-level bike for urban and city riders as well as for serious cyclists. This review covers the benefits, pros, and cons of this particular model. 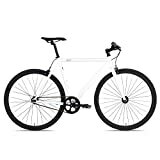 It also covers the reasons why it is considered as a fixed gear bike or a fixie. So feel relaxed! Basically, bikes with fixed gears are not for everyone. You should also know that it isn’t a high-performance bike because it is stripped of all high-tech features and is incredibly simple. It only comes with a frame, chain, and handlebars. You simply get on a ride with it and that will we all. You might not have all the benefits of some sophisticated features that you may know like the gear shifters but then you are not so bothered with its upkeep. Interestingly it lasts longer than even the so-called complicated models out there. So in the end, you may have succeeded in getting yourself a bike that is simple in style and function and yet more valuable and durable. Taking a quick look at the Takara Sugiyama flat bar fixie bike, you will only see a standalone bike with its minimalist piece of art. It has a sleek design and is very good looking. The color combinations and style of the black and blue version of the Takara bike are very pleasing to behold. One capturing part of this bike is the flat handlebar with 700 by 32 tires for smooth city ride. The pedals of the commuter bike are stylishly decorated with their own reflectors. These reflectors are designed on purpose to match the color theme of the entire bike. Realizing that your means of transportation is talking so much about the life you lead will make you avoid a bike that feels awkward when you ride on them. Well, this will no longer be a problem as a commuter when you ride on the Sugiyama bike except you hold something against style and simplicity. ● Comes in three sizes; 50cm, 54cm and 58cm. For riders who are 5” 7’ and below, the smallest size of this bike might be large for them. One notable and obvious feature of the Takara bike is the absence of the derailleurs. As a city commuter bike and city riding a bike, the Sugiyama bike is fitted using a flip-flop hub. This feature makes it able to run either in single speed mode or as a fixed gear. Note that the single speed mode can only run in the standard freewheel. The flip-flop hub gives the rider a great option to choose from for riding. We all know that the functionality of a bike solely depends on the type of material used in making. The Takara bike has the trademark of good and reliable materials. It used handcrafted steel in making the frames, the alloy wheels and pull brakes. Both alloy wheel and pull brakes are lightweight and yet durable. The Takara Sugiyama flat bar fixie bike weight is about 30lbs which are why it is light, agile, and manageable. Comparing its functionality and performance within its target niche, you will see that it is quite excellent. These tires offer far more great value than the standard ones that come with another brand within the same price range. However, its tire functionality depends on the terrain where the rider is. Well, this is not a major issue as you can change to more rugged tires if you really need them. The Takara bike is designed for both man and woman urban bikers having different color options to entice any rider. It basically comes in two sizes – about 54cm for small and 59cm for large size; you can pick from three stylish and attractive combination of colors. Its color scheme includes black and blue, blue and gray, and orange and yellow. Not only does the Takara uses the flip-flop hub for single speed modes or in fixed gear, but it also comes with the 32 hole alloy wheels and 700/32 tires designed by Kenda. These tires are however larger than those of standard road bike which is why this bike is for taller riders. This ensures you have a smooth and easy ride. The front and rear side pull brakes for instant halting rounds out the simplicity of the Takara bike parts. Are wondering what the brakes are for since it’s a fixie? Well, as you ride in single speed mode, the brakes are helpful for halting as the wheels do not slow down when you pedal slowly. Q. what is the weight of this bike? I am 5 feet 4 inches, can I use this bike? A. Its shipment weight is about 31lbs, and of course, you can ride this bike – its smaller size. Q. Is it good for the rough environment? A. I wouldn’t advise using it on rough terrains as it could puncture the tire except you have to change to more rugged tires. Q: does it have rear brakes? This bike also comes equipped with a flip-flop hub with both. Whether you are a commuter or an experienced rider, this bike will work just fine for you. The major difference between this bike and the Takara is the custom riser bars for comfortable urban city ride. You can find the golden cycles in the same price bracket as the Sugiyama but in 5 different sizes. 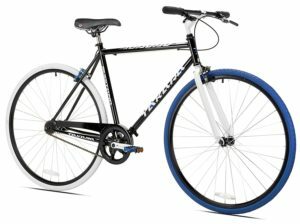 This is also a fixed gear or single speed freewheel bike because it is also built around a flip-flop hub. You can change the installed single speed setting when you remove, flip and then reinstall the rear wheel. This is why it is referred to as a speed demon and it comes with the rear and front brake system for safety. One advantage it has over the Takara is that it is available in 5 different sizes with the smallest size being 43cm and the biggest size being 61cm and cost just a few bucks more. This bike is a solid, affordable urban track bike. Unlike the Takara, it features the risers bar for fast navigation. Its allow frame and alloy fork offer you the best performance you can get. You can get this bike for recreation or as a means of transport daily. You can also choose your color and size when you have to purchase one. It comes in 4 different sizes with 49cm as the least and 58cm at max. Anyways it is more expensive than the Sugiyama but not so much. With this detailed Takara Sugiyama Flat Bar Fixie Bike review, you now know how comfortable, agile and portable this urban and commuter bike is. For commuting, it offers comfort and lightness to the rider. It also provides a smooth ride through city roads. It has a beautiful and amazing color that makes it so stylish. Its simplicity requires no hassle and extra cost in maintenance and yet offers high performance within its range.